ripple is a canopy project in suzhou, a city brimming with exquisite gardens and waterside architecture. we are fascinated by the city’s double chessboard layout of “water and land in parallel, canal and street in neighbor”. the idea for the canopy design developed in response to this historic context, as a way of celebrating the beauty of its tranquil cityscape. 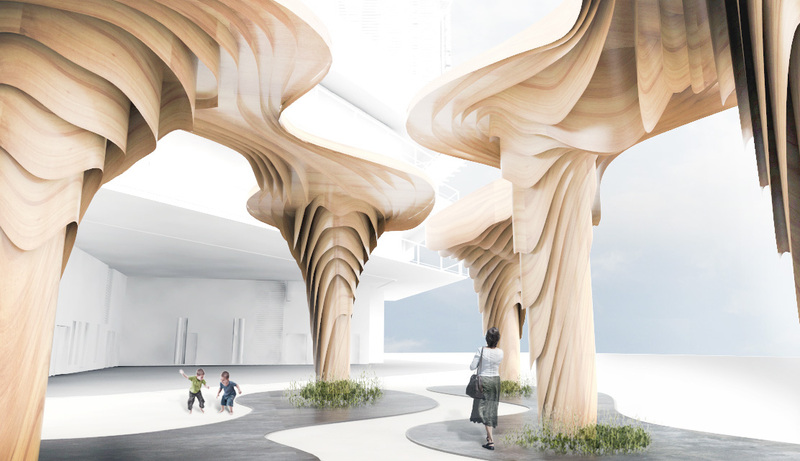 designed to re-interpret the charming natural beauty and harmonious construction, the fluid form canopy and structural themes first explored the water pattern and tree canopies. experimenting with the idea of a structure based on the water ripple, we developed a scheme with of partial shade canopies with a slit in between, mirroring the waterways interweave with architectural context. the ripple exudes an ambiance of harmony and balance, forming a landscape where people can find inner peace and serenity.